Vintage mountain lodge w/ dog-friendly attitude, hot tub, & three decks! 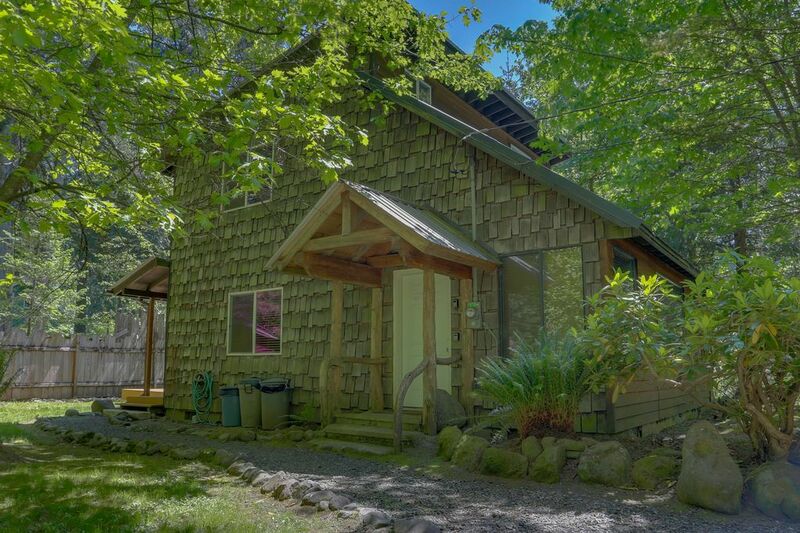 This dog-friendly home in Welches offers a private hot tub, three decks, views of the creek, and at-home entertainment, like cable and a selection of board games. This rental also has a private washer/dryer and limited mobility access. Owned by a New Zealander, this home also offers fun Kiwi-specific information throughout. Mt. Hood Meadows is the largest ski resort in the area, only 22 miles away, and historic Timberline Lodge and Ski Area is 16 miles away. The Resort at the Mountain offers golf a half-mile down the road, and other area activities include rock climbing, horseback riding, fishing, and a variety of other outdoor activities. Palmer Glacier is 16 miles easy for summer skiing, and Mt. Hood National Forest, which surrounds the town of Welches, provides opportunities for plentiful hiking, biking, and other nature-based activities. The house is great. The hot tub is awesome. Overall very comfortable place. It's a little close to neighbors and the road in is very rough during the winter. The location is great and very close to all that is great about Mt. Hood in every season. Great house. Very warm and cozy. The place is great. Hot tub is nice. Rooms are comfortable. Highly recommend. Great home-base for fun in the snow! Our family just returned from a great stay here! The cabin was clean and comfortable, and it had everything we needed for a fun long weekend in the snow! We had easy access to local ski resorts and even found a great nearby spot for the kids to go sledding. The cabin is also close to the groceries, a bakery, pizza, etc. The beds were very comfortable. Also, our youngest son and nephew loved the closet twin beds (probably not ideal for adults, but a real treat for 5/6-yr-old boys). We enjoyed sitting out on the little covered deck off of the upstairs king bedroom - a perfect place to sip coffee/wine and enjoy the wooded creekside view! The hot tub was clean and clear and just the perfect temp for us (set at 104). The only reason for the 4 star (rather than 5 star) rating was a run-in we had with a neighbor. Our nephew accidentally let our dog out while we were upstairs and didn't tell us until we heard barking outside. She was still on the rental property, separated by a fence from the neighbor's dog, but they were barking loudly at each other. We had been there for two days at that point, and this was the first time she had been outside off-leash and the first time she had encountered this neighbor's dog. The neighbor seemed extremely frustrated - yelled at us the whole time we were collecting our dog and bringing her back inside about how he lives there and every weekend we renters come and let our dogs run wild. I am guessing there have been issues with previous renters, and this is certainly not a poor reflection on the property itself - but I think his sensitivity is something to be aware of in advance if you plan to stay here and bring your pet. Overall, we had a great time and would definitely return! With three bedrooms and two bathrooms this cozy house worked great for three rotating couples. We were celebrating my birthday and had different guests come during our three days. It was close enough to cross country ski trails for some of us and snowboarding for others, and we all enjoyed hiking along the Salmon River, one day in mist and one with fresh snow. The house itself is well furnished and uniquely decorated, a special place to share. However, it was mostly too stormy to enjoy the outside and difficult to walk our dogs, as prior renters hadn't picked up after their dogs in the yard and the huge mud puddles in the road made it impossible to walk that direction. One thing that needs improvement inside is the first floor closet is broken and can't be opened, so that room was crowded and inconvenient for guests who wanted to hang up their clothes. By contrast the upstairs bedrooms were spacious with high ceilings as well as comfortable. We enjoyed the décor and would happily come again to share with perhaps one couple. I'd also recommend for two couples plus infants (for closet beds) and up to teens for the small bedroom downstairs. We appreciate your feedback, Donna, and will look it over closely with the property manager. Thank you! Everything was beautiful and fun. Would definitely come back. The hot tub had no power. The coffee maker was dead. But this doesn’t matter. All in all we had a very fun vacation here. I would recommend this place to anyone in the world. It is an excellent experience. We are happy to hear you had an enjoyable stay with us! Our local property manager has since repaired the hot tub and purchased a new coffee maker for the home. We look forward to hosting you again soon!